The Hummingbird trail packs a mixed bag of terrain; loose rocks, large boulders, an 8-10' roller drop, tight switchbacks, high-speed sections, and a few small jumps. The trail can be hiked with a DH bike from the trailhead at the Rocky Peak exit, but you'll need a shuttle from the bottom of the Hummingbird trail. 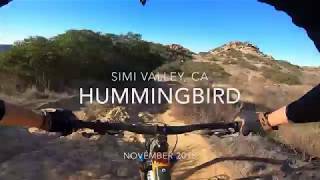 If you want to ride your All Mountain bike, ride the Chumash/Hummingbird Loop. The only negative is that it's gotten quite a bit of use (and abuse) from the DH'ers who have sadly cut new trails across sections that used to be nice, technical switchbacks.